Dress has wide scoop neckline, fitted bodice and kimono sleeves. Gathered soft pleats at the front sides release fullness in the slim skirt. Contrasting notched bands trim the neckline and short sleeves in Version A. 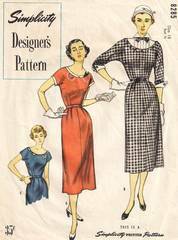 Version B is featured in a checked fabric with contrasting pointed cuffs and tucked yoke. A ribbon slipped through the neckline in Version C.
Envelope is complete; average aging. Uncommon, large format envelope ( 8 by 10-3/4 inches) from the Simplicity Designer's Pattern series issued in the early Fifties.